A University of Southampton physicist has been named as the Very Early Career Woman Physicist of the Year by the Institute of Physics (IOP). Kate Sloyan, an EPSRC Doctoral Prize Fellow in the Optoelectronics Research Centre (ORC), was given the honour at a special ceremony in London. The IOP award, sponsored by Shell, is a celebration of the achievements of female physicists at a very early stage in their physics careers. It is awarded annually to a woman who is within five years of completing her undergraduate degree in physics and who is either working as a physicist or is engaged in postgraduate study. Kate beat off competition from other shortlisted candidates to be selected for her research into optical crystal engineering using pulsed laser deposition. She has developed a simple but powerful tool that allows quick automated growth of multilayer crystal stacks that has already attracted interest from industrial partners. Kate has also been involved in extensive outreach work encouraging other people, particularly young people, to make a life in science. 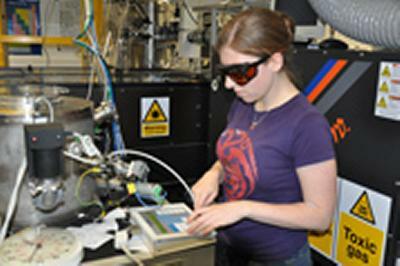 Kate recently completed her PhD investigating growing crystals with lasers and has now gained EPSRC Doctoral Prize funding to allow her to continue her research in the field. “I am absolutely delighted and honoured to have received this award. It is recognition for all the hard work I have put in and all the support and encouragement I have been given by my supervisors,” said Kate. “I am particularly pleased that it reflects the outreach work and other such activities that are not directly related to the project I am working on, things that are ultimately vital but are perhaps not always seen as necessary,” she added. Kate was presented with her £1,000 prize by Sally Martin, chair of the Shell Women's Network UK.